The concept and identity of Burrito Beach as a Mexican Grill and Beach Club was defined, matching its goals for a large-scale rollout that catered to urban and suburban shopping locations. Catch the Wave graphic identity, social media, and signage worked well alongside the refreshing beach aesthetic. The bright and bold design proved both successful and catchy, as Burrito Beach continued its progress and development into city centers and shopping malls. 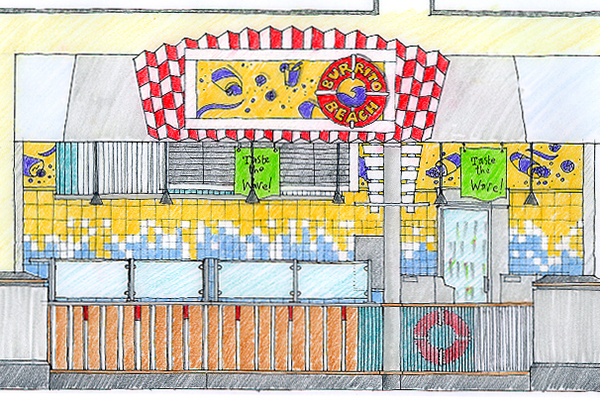 The design below was for an installation at the Old Orchard Shopping Mall Food Court, where the “hot” beach sensibility married well with its spicy, bold, and healthier Mexican cuisine.